Nelson and Colne College students and In-Situ have created an inspiring exhibition of the arts which will run this weekend. 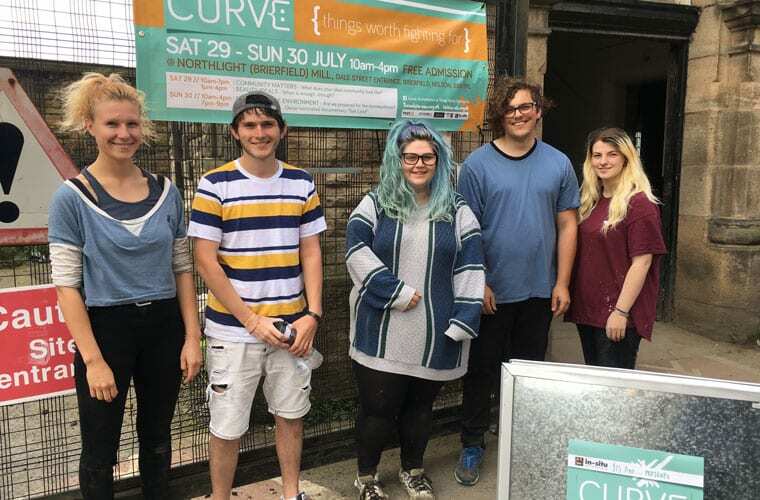 ‘Curve: An exhibition of things worth fighting for’ will be held at Brierfield Mill on Saturday and Sunday and In-Situ has been collaborating with creative students from NCC to curate this exciting exhibition. Working with NCC, In-Situ has developed a young artist collective ‘Yes And’, a programme designed to support the artistic ideas and ambitions of young people in Pendle. The event will be hosted in Pendle’s upcoming venue for contemporary arts Northlight (Brierfield Mill), a grade two listed building dating back to 1832. This iconic mill is being transformed into a new living, working, leisure and arts- cultural destination. This two day event will run from 10am until 4pm and feature artwork, performance, film, conversation and music with each day focusing on different theme of ‘things worth fighting for’, uniting people through the issues that are important to them. As well as the students own work, they reached out to other artists from across the county who have submitted work which responds to the theme in their own way. Paul Hartley, Director at In-Situ said: “We are proud to be working alongside these talented and enthusiastic young people. Morag Davis, Head of Art and Design at Nelson and Colne College said: “We are delighted that our students have had the opportunity to work with In-Situ on the ‘Yes And’ project and we value the ongoing collaborative support that In-Situ provides for our young artists. “We are committed to providing all our art and design students with exciting and challenging opportunities like this, which will support them in their University applications and career choices. Free admission and refreshments and the exhibition is supported by PEARL, Super Slow Way, Nelson and Colne College and Lancashire County Council. The exhibition can be found through the Dale Street Entrance, Brierfield, Nelson, BB9 5PL.